There's no bigger name in the entire guitar world than Eric Clapton! The man is a legend with a career that spans over 40 years! 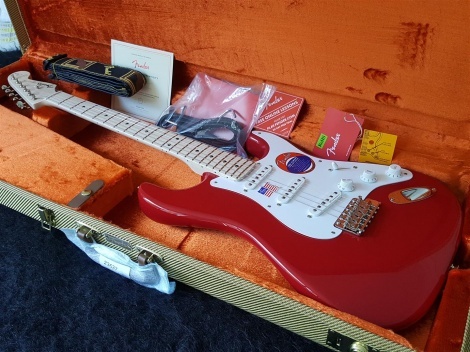 So, as you can imagine, this is one musician that can play any instrument he chooses - and he chooses the Fender Eric Clapton Artist Series Strat. That's right, the same guitar you can own (though his comes with a custom paint job these days). The Eric Clapton Strat has been updated with three Vintage Noiseless pickups, which work in conjunction with both a powerful active midrange boost and Fender TBX tone circuitry to create on of the most versatile guitars in the Fender catalog. Thanks to the active 25dB midrange boost and TBX circuitry, you can go from crystal clear tone to a full-throated growl with the simple spin of a knob. Combine that with three of the latest versions of fender's Vintage Noiseless pickups and Eric's personal choice of a blocked American vintage synchronized tremolo, and you have the makings of a truly soulful instrument that sounds as great in the studio as it does onstage! It comes standard with a modern 5-way blade switch, making it easy to access all the pickup combinations. But then it adds a special active 25dB midrange boost on one tone control to give this guitar the extra meat you might expect from a humbucker. In addition, the second tone knob functions as a standard Fender TBX master tone control, which can smoothly go from bright and glossy to dark and smoky by rolling off the highs! It comes with a 1-piece maple neck and fingerboard with 22 vintage-style frets and Eric's personal favorite soft V shape. In keeping with contemporary player preferences, the fast-playing neck is finished in a smooth satin polyurethane. Vintage Tweed Case included and case candy.